Summary: Inferior vena cava (IVC) agenesis is a rare anomaly that is usually an incidental finding in radiologic work-up or it can rarely be symptomatic due to deep venous thrombosis of iliac veins. 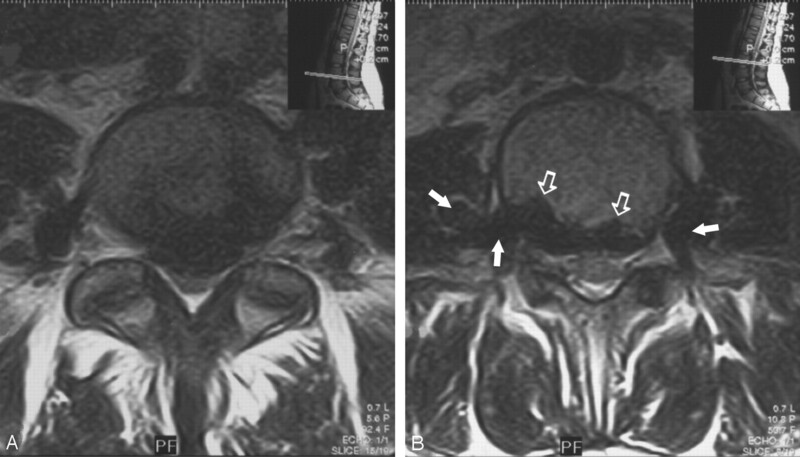 In this report, we present a case of IVC agenesis detected on lumbar spinal MR imaging scans by extensive epidural-paravertebral collateral vessels compressing the thecal sac and causing low back pain in a child. Estimated prevalence of the anomalies of inferior vena cava (IVC) in the general population is about 0.07%–8.7%.1 It may be totally asymptomatic or may be complicated by venous thrombosis, alerting the clinician to the diagnosis; however, low back pain is not an expected outcome of this condition. A 13-year-old girl with a 5–6-month history of low back pain worsening during lifting was referred to our institution, and a lumbar spinal MR imaging examination was performed as part of the diagnostic evaluation of her symptoms. MR imaging scans showed tubular structures located at the anterior epidural space along the lumbar segments of the spinal column, with low signal intensity on both T1- (spin-echo sagittal; TR/TE, 400/14 milliseconds; section thickness, 4.0 mm; matrix, 224 × 256) and T2-weighted (fast spin-echo sagittal and axial; TR/TE, 3000/96 milliseconds; section thickness, [sagittal] 4.0 mm/[axial] 5.0 mm; matrix, 192 × 256) series, which happened to compress the thecal sac and were in communication with paravertebral tubulonudular structures by means of neural foraminae on both sides having similar MR signal intensity. Scalloping of the L3 vertebral body at its posterior aspect secondary to compression was also noted (Figs 1 and 2). Signal intensity loss and location along the site of basivertebral plexus and the left paravertebral structures in continuity with another larger diameter, para-aortic fusiform structure were suggestive of the vascular nature of the lesions. Additional cranial MR imaging with gadolinium, as well as an abdomen-oriented, contrast-enhanced dynamic MR angiography (MRA), was performed to define the extent of the disease. For the angiographic examination we used a 3D-fast spoiled gradient-recalled sequence with an injection of 0.2 mmol/kg gadolinium followed by 3 sets of acquisitions within separate breath holds (TR/TE, 6/1.2 milliseconds; section thickness, 3.0 mm; matrix, 128 × 256; flip angle, 20°; NEX, 1). MRA and the upper-spinal MR imaging revealed the enlarged internal and external venous plexus veins at the anterior epidural and paravertebral space, respectively, with an extent to Th10 level and communicating with the azygos-hemiazygos veins. The infrahepatic segment of IVC could not be defined as a separate structure, though suprahepatic segment was formed with normal caliber. Common iliac veins were seen up to the conjunction level and communicated with both vertebral and epigastric veins afterward, because this seemed the only drainage pathway other than IVC. Renal and ovarian veins also drained into the azygos-hemiazygos system (Fig 3). With these findings, the patient was diagnosed with IVC agenesis associated with enlarged collateral pathways, including vertebral-paravertebral plexus causing low back pain due to thecal sac and neural foraminal compression. The patient was discharged after palliative treatment of her symptoms, and she was taken into follow-up regardless of whether the symptoms worsened. 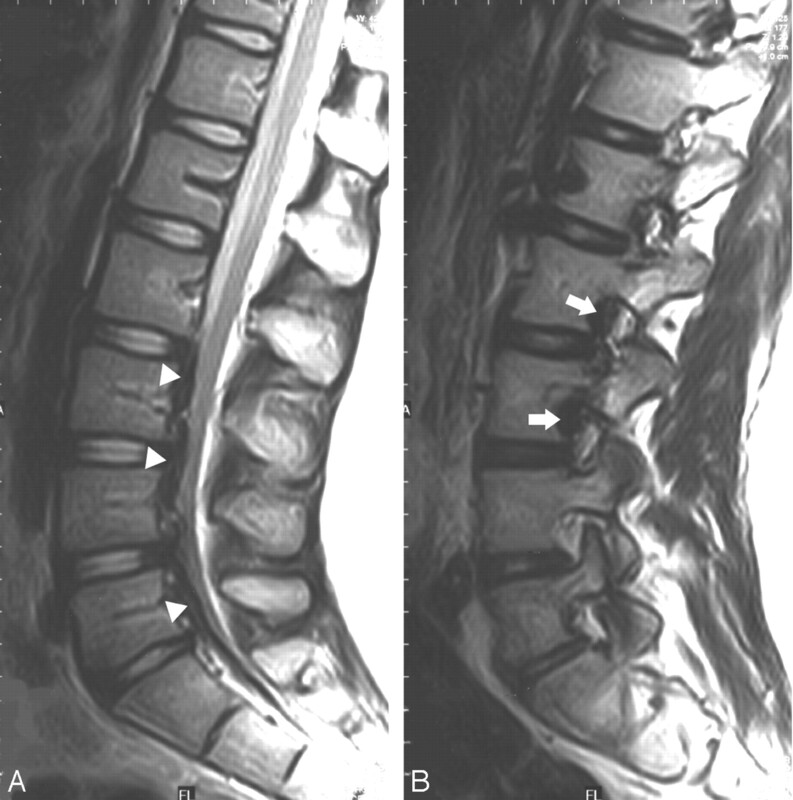 A, Axial T2-weighted spinal MR image at the level of L4–5 shows enlarged epidural veins characterized by signal void, causing a mass effect and displacing the thecal sac posteriorly. B, More cranial image depicts the scallopping of the posterior margin of L3 vertebra (open arrows) and the continuity of the epidural veins with paravertebral venous plexus via neural foraminae bilaterally (arrows). A, Midsagittal T2-weighted scan shows the prominent epidural venous plexus below level L2 (arrowheads). B, Sagittal T2-weighted image shows the enlarged veins obliterating the neural foraminae of level L2–3 (arrows). Venous phase of the 3D contrast-enhanced MR angiographic study, on a coronal MIP (maximum intensity projection) images. A, Enlarged vertebral venous plexus (VVPx) consisting of epidural and paravertebral veins (arrows) extending up to the renal hilus level and consequently draining into the azygos-hemiazygous veins (open arrow). B, Infrahepatic inferior vena cava cannot be distinguished as a separate structure. Common iliac veins appear at the conjunction level just behind the common iliac arteries (arrows) and drain into the VVPx eventually (not shown here). 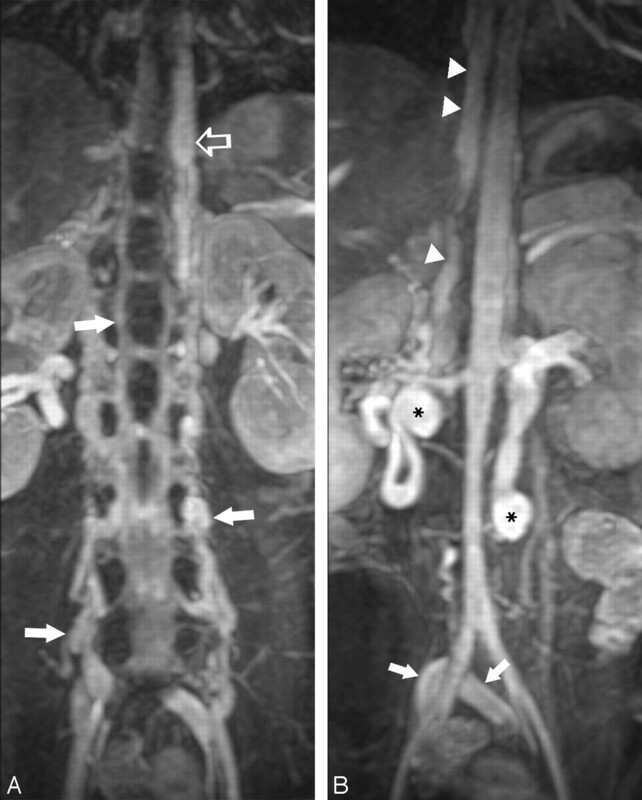 Enlarged left ovarian vein and a large-caliber tortuous right renal vein as a secondary drainage pathway of the lower body segments, as well as the VVPx, can also be recognized (asterisk). Arrowheads indicate the enlarged azygous vein. Embryologic anomalies of the IVC and its tributaries occur infrequently, resulting from maldevelopment of lower body venous system. Variations can be classified according to the abnormal regression or abnormal persistence of various embryonic veins, the most common ones being left IVC, double IVC, azygous continuation, circumaortic or retroaortic left renal vein, and absent infrarenal IVC.5 Embryogenesis of the IVC is a complex procedure mainly involving the formation, regression, and fusion of 3 paired embryonic veins: postcardinal, subcardinal, and supracardinal. The infrahepatic segment of IVC can be examined in 3 parts—the suprarenal, renal, and infrarenal segments—where the right subcardinal vein gives rise to the suprarenal segment, the right supracardinal-subcardinal and postcardinal-subcardinal anastomoses form the renal segment, and the infrarenal segment derives from the right supracardinal vein.5–7 Absence of the entire infrahepatic IVC as in the case presented here suggests that all 3 paired venous systems failed to develop properly. Patients with IVC agenesis may present with symptoms of lower extremity venous insufficiency or idiopathic deep venous thrombosis.5 If the deep venous collateral system is sufficiently developed and drains the venous blood from the lower extremities to the heart, venous stasis secondary to inadequate blood return through collaterals (resulting in subsequent deep venous thrombosis) is likely to be prevented.1 The patient presented here had a very large collateral pool draining the lower body venous blood, which reflects the compensated long duration of the process but caused a mass effect secondary to the very large amount of blood overloading the vertebral-paravertebral venous plexus. This mass effect was typically worsening during an activity increasing the intrathoracic pressure (such as lifting), resulting in the decrease of venous return and aggravating the mass effect of the vertebral venous collaterals. The presence of an epidural or paraspinous mass continuous within multiple spinal segments, particularly showing signal intensity void on MR images, should raise the suspicion of a vascular anomaly. Cross-sectional imaging methods facilitate the recognition of these anomalies andavoid a misdiagnosis of a true solid lesion, but MR angiographic imaging is invaluable to define the final diagnosis. Overloaded and enlarged venous structures have the potential to compress the nervous system (either the spinal nerves and spinal cord or thecal sac), eventually causing neurologic symptoms, which might be the only and initial symptom; however, venous insufficiency resulting in deep venous thrombosis is a more frequently expected consequence of IVC agenesis. Accepted after revision May 4, 2005.